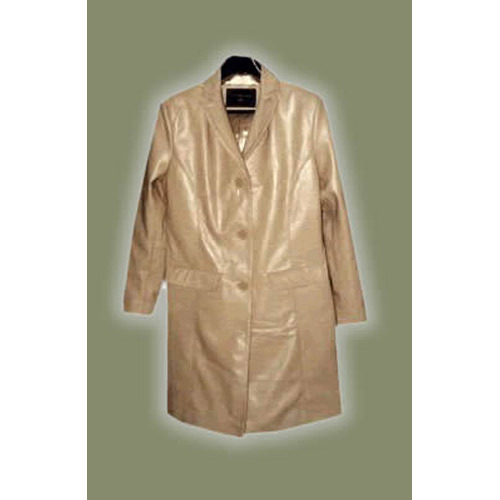 We are a coveted organization that is engaged in manufacturing, supplying, wholesaling and exporting Ladies Leather Long Coats. The range offered by us is tailored under the watchful supervision of our experienced and skilled designers. Designed with perfection, high quality leather is brought into use that is sourced from reputed vendors of the market. Annual Turnover2012-13 Rs. 1-2 Crore Approx. Inaugurated in year 1989, we, Aress International, are one of the prominent manufacturers, exporters and wholesalers of a nice assortment of Leather & Cotton Dresses. Our offered range of apparels includes Mens Leather Jackets, Leather Trousers, Leather Waistcoat and many more. By focusing our attention on clients’ requirements and our thorough understanding of fashion, we have established ourselves as one of the remarkable brand names by sustaining our fast growing business. We export our products to Europe and US. We are enriched with highly professional and strong marketing network to ensure the conformances of schedules. We do an extensive research to select our vendors for procuring quality grade leather. Our infrastructural unit is backed by all modern manufacturing machines based on sophisticated technology to design and develop leather apparels. Moreover, we have a dedicated and efficient team of logistics, marketing & exporting consultants and warehousing personnel who put in sincere efforts to boost our business. With the aid of our quality controllers, we make sure that each and every leather garment dispatched from our unit is completely defect-free. Our well-coordinated and highly enabled team of logistics professionals always tries to deliver products within the promised time frame without compromising on the desired quality.